Black Diamond pushed the envelope with the 01, getting it out their first-to-market, following the formula they’ve consistently used in the past to test and refine a product that is primarily designed for “aggressive” skiers whom like an “active” binding. I have been skiing the O1s as my primary free-pivot binding for the past season and a half. I have skied the 01s mounted on BD Havocs in every type of snow condition imaginable, as well as most types of terrain, ranging from wide open powder, steep, icy chutes, tight trees, Sierra muck, windboard, etc. etc. These bindings have seen it all. Despite the effort, and most likely incurring the wrath of O1 lovers and designers, I have really not warmed up to these bindings at all. I just really don’t care for them, find them a liability in many different situations, have had icing up problems the majority of the time, and cartridges lossening at inopportune moments. On top of this, I hate the pivot point, and I hate the way they force me to ski. I can ski them, but they just aren’t much fun. Most of my ski partners can attest to much cursing and criticism during tours and escapades. Now this isn’t a problem inherent with the 01, it’s more a problem with them matching up with the way I like to ski, how I was taught, learned (leather boots to the 1st and subsequent generations of Scarpas and Rivas and finally to full-time G3s every since they were introduced). I was BD guy. I loved the original Rivas, and the Riva IIs were fine as well, given the competition, but after that, I stuck with G3, had some very formative years on the Targa and T9. And after a season-and-a-half of trying to like the 01, of changing my style and forcing my technique to conform to the BD feel and active nature, I cannot do it any longer. I believe that the best binding is the one you do not think about, the one where you do not have to think about throwing a turn no matter what, you just do it. For me, the O1 prevents me from doing this. I find myself, even though I am a very upright and alpine-like telemark style, having to really get lower than I would want and drive the boot with more effort than I believe is necessary. I know this statement is contrary to almost everything written and said about how to ski the O1, how it actually engages faster, drives better, enables a more upright stance, etc. ; IF you change the technique and focus on using the ball of the foot. I like using my toes and feel that I have way more refined control over the turn when I ski the way I know and love. The O1s killed all of my confidence on steep, firm terrain, and in the flats, coming out in the flats, they forced me to endure a calf-workout that was ridiculous – why so much work to ski parallel through the flats? It shouldn’t have to be so hard. So this relationship was not meant to be.Aside from the general lack of skiability for me, I really found that the problems I encountered using these bindings so often made them a liability in many other ways.Now I am all for modifications and dialing in gear to suit one’s tastes and specific needs, especially when one sees a problem arise, but a number of issues have occurred that really make me hesitate to take these bindings out on serious tours where I am far from the road or skiing something steep and firm with exposure. Ultimately, the right binding is the one that skis the most naturally for you, given your particular style, snowpack, interests, etc. with the fewest related technical problems. 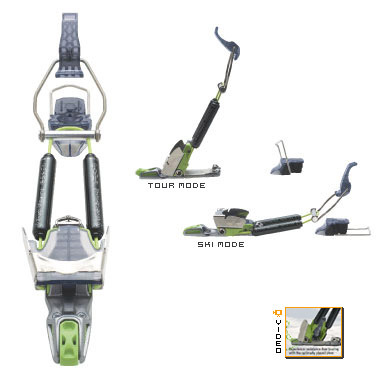 For me, the O1 didn’t ski well, and the icing/mode switching and cartridge lossening issues all forced the issue and made the decision a really easy one: go with the Switchback or Voile.